We’re meeting this artist for the first – and probably last – time on these pages today which normally might not tell you everything you need to know about them, but usually tells you one pretty notable fact… that they weren’t very successful. Though the record itself might not have raised more than a glimmer of interest, then or in the years since, and the credited artist may have only cut a handful of sides on record, the name itself should be universally known by any legitimate fan of the music of the mid-Twentieth Century in not just rock ‘n’ roll but blues, jazz, you name it. But since what should be the case when it comes to music history awareness is rarely so, that means for many the name Tuff Green is ripe for discovery. While it’s true that his recorded output is limited, particularly in rock ‘n’ roll, his overall musical influence is hardly lacking. How about with a few seemingly random trivia questions. In 1962 saxophonist Ace Cannon had a huge hit on Hi Records out of Memphis called Tuff… any thoughts as to whom it was named after? Ten years earlier Roscoe Gordon cut a huge hit called No More Doggin’ in the living room of a guy named Tuff… could that be the same person? A few years before that – this same year that we’re covering now as a matter of fact – bluesman B.B. King cut his first sides for Bullet Records – the same label today’s record came out on actually – backed by the band led by a certain bass player named Tuff… do you think there’s a connection? There is. Obviously. The bass player in question is Richard “Tuff” Green, the leader of the premier club band in the musical metropolis of Memphis, Tennessee. So it’s rather fitting that someone who was such a presence in the Memphis music scene for years, despite such limited recorded output, becomes the first record we’ll review to come out of the city often mistakenly called the birthplace of rock ‘n’ roll. In the process we’re introduced to the guy who would, in a roundabout way, lead to the success of the aforementioned artists as well as much of the cream of the Memphis labels of the 1960’s and 70’s such as Stax and Hi, which includes of course everyone from Bill Black to Otis Redding to Al Green. Now does any of that pique your interest? Yeah, I thought it might. Music is a continuum, we’ve said before, and Tuff Green epitomizes that better than most. Green had gone to school with Jimmie Lunceford, who as we’ve also mentioned in the past was the true King Of Swing, arguably the finest bandleader in the 1930’s and early 1940’s whose death (at the hand of racist whites) in 1947 essentially marked a symbolic ending to that era of black popular music, just before rock’s birth later that summer signaled the start of the next era. 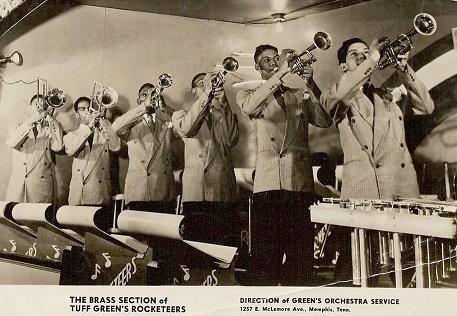 Green’s stature among the black musical elite in Memphis was already well established before he made his foray into the studio to cut sides for Bullet. He’d been running his own makeshift studio in his house, which incidentally was a block away from the home where Aretha Franklin was raised until her father The Reverend C.L. Franklin moved them to Detroit where he became one of the most famous preachers in black America, just in case you wanted another connection to chew on. This home studio, crude as it was (they hung blankets on the walls to absorb the sound) was what gave many local singers in the area the chance to make a record long before Sun Studios came into play and before local labels like Duke and Meteor sprung up. Those aspiring artists also had the benefit of being backed by arguably the greatest self-contained band in the South at the time. Jazz legend Mose Allison once stated, “I always tell people that the original rock ‘n’ roll band was Tuff Green in Memphis… in 1947 – ’48”. That band he speaks of, known as The Rocketeers, consisted of some of the most skilled musicians to ever come out of the city from drummer Phineas Newborne Sr. (his son, that would be Junior, who also played with them, would soon become one of the greatest jazz pianists in the world), sax aces Leonard “Doughbelly” Campbell and Ben Branch and a trumpeter named Willie Mitchell who’d later go on to be the greatest producer the city had ever known, overseeing Al Green’s incredible 1970’s run most notably. Anyway you look at it that’s a lot of tentacles spreading through all sorts of musical eras and idioms, from Lunceford’s swing to King’s blues and through Mitchell you had not only Green’s ‘70’s soul and the sparse instrumental hits on Hi throughout the late 1950’s and 60’s but also half of the original MG’s that defined the Stax sound, as drummer Al Jackson Jr. and bassist Lewie Steinberg came up through the house band for The Plantation Inn that Mitchell went on to lead in the 1950’s. The connecting thread to all of it in one way or another was Tuff Green. So that begs the question why haven’t most people HEARD of Tuff Green? Why then, if he was so good, did he not make more records to be heard rather than be shrouded in an historical netherworld of neglect? Well, at the time in many areas records were not the be-all and end-all of musical success. 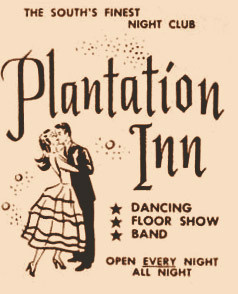 In cities like New Orleans, the true birthplace of both jazz AND rock ‘n’ roll, and in Memphis, the home of the blues and the second home if you will of rock, there was enough musical passion coursing through the cities’ veins to support a vast array of clubs which were packed to the gills each and every night earning the house bands more money – for less hassle – than they ever would’ve received by merely cutting records and hoping for a hit, then being forced to go on the road for months on end to promote it. By contrast these club bands had all of the acclaim they could use, reputations built over time which weren’t dependent on the sales of their last release and their status gave them the staying power to ensure they’d always have work in the city, all while being able to have a normal home life. As B.B. King himself explained, “Tuff’s band never made records, but didn’t need to. They worked all over, just off their reputation. White people came to hear them play country (music); blacks came for swing or be-bop and Tuff was never ashamed to play the blues”. …Or rock ‘n’ roll as the case may be. King got one detail wrong however, they DID make records, just not very many, but when they did get coaxed into cutting one they definitely had good instincts when it came to content, as Let’s Go To The Liquor Store shows. There’s plenty of jazz to be found in this, more so than would be advisable for the stretch run of 1949 actually, when rock had distanced itself from the jazz-leaning beginnings it showed back in the tail end of 1947. The horns that open this are what are firmly rooted in jazz. They swing more than honk and are in a higher register than the gutsier sound that rock preferred. But they have the right idea by keeping the riffs repetitive, concise and moving. In fact their playing comes across as faster paced than it really is, a neat arranging trick that gives this more pep. 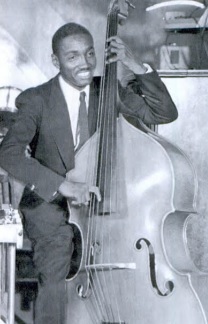 Green’s bass is prominent but we’re a long way off from the more whimsically inventive bass playing that both jazz and rock would later show, as this is simple, direct and played with purpose, which is to establish a strong bottom along with Newborn’s drumming which is firmly in the pocket. The theme is a familiar one to rock fans and one of the things that gives the song something of an uneasy pass into the rock kingdom as obviously rock ‘n’ roll has more than its fair share of drunken reprobates in its history. But every style has to have its borders drawn somewhere and Let’s Go To The Liquor Store is on the absolute limit of the region. Call it unincorporated territory if you will… like Puerto Rico, Guam and the U.S. Virgin Islands, where their residents are American citizens without voting privileges. The same is true here. Tuff Green and company are free to travel without restrictions but aren’t moving to the mainland anytime soon. One of the reasons for this can be found in the song’s writer and primary singer, J. P. Lauper, whose tone is just a little off for what he’s supposed to be doing… rocking, not drinking that is. His higher slightly wheezy tenor comes across as sounding too flighty in a way to be utterly convincing. It’s a jazzier voice in some respects. He’d probably be more convincing if he were singing about trying to score a dime bag of weed, something that was a more common vice in jazz, but a rocker looking to get smashed with booze demands a bit more gravity in their voice, more scar-tissue on their larynx, more roughness in their delivery… more Wynonie Harris in other words, if you want the easiest reference. Without that ability to fully convince you he’s as eager for a nip as he wants you to believe the song’s authenticity is too tenuous. The band members help him along as much as they can with a call and response tactic that is designed to suggest this is a group of no-good thrill-seekers, but no true degenerate winos are this orderly in their cries for a packy run. A lot of this could be remedied with more… well, I was gonna say “booze” to loosen them up, but I’ll just say “enthusiasm” and leave it at that. In other words, their refinement in how they approach this does them in. Take the sax solo, which is normally the point where all hell breaks loose in rock ‘n’ roll. If this is indeed Ben Branch we know that he’s got as much skill as any of the more wild horn players on the scene, but he’s got too many inhibitions that are holding him back. He whines more than squeals, his playing is the definition of paying a high price for watered down drinks. But there’s still a pretty decent song to be found here if you strip it to its frame and then built it back up with more appropriate materials… Throw in a more raucous horn break, create a racket with drum fills, let the piano pound out a more emphatic rhythm and get Lauper plastered to the gills before you turn on the tapes and… well, if you did that I suppose you’d might as well get a whole new crew in here to cut Let’s Go To The Liquor Store. Let’s not be too harsh on them though even with their underwhelming appearance here. There needs to be a dividing line drawn somewhere early on and those who lean back towards a more refined style have to be put on display so that line is fully understood by others. That’s what makes those who gleefully crossed that line, in many cases broad jumped across it, so revolutionary. When looking back from a perspective of seventy years there’s always a risk that ALL of these early rock songs – even the best of them – will come across as too tame, too compromised, too pre-historic for lack of a better term, to be convincing that this was indeed the start of a musical insurgency. But context has the ability to put that in perspective and while it’s one thing to showcase entirely different musical genres, pop, or mainstream jazz, urban blues, country and gospel, to mark the divide, it’s arguably more effective to show a group like Tuff Green’s Rocketeers who made their living – and a GOOD living it at that – by bridging the gap between styles and getting a lot of acclaim from their contemporaries for doing so. Which is why it winds up being a tribute to those rockers who didn’t fall short during these early days, despite perhaps possessing far less musical skill, that when Tuff Green and The Rocketeers were called upon to deliver the real deal on record… that for all their skill… for all their musical know-how… for all their good intentions… the results are surely not 100 proof… not even 86 proof. More like about 60 proof, which is another way of saying that by imbibing this you won’t even get tipsy. But that doesn’t mean we can’t raise a glass to them for helping so many others along the way and for being the ones to act as a welcoming committee for Memphis in our journey through rock history. 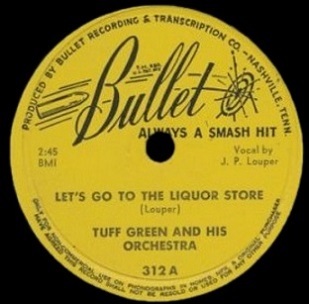 Leave a reply on "Tuff Green: “Let’s Go To The Liquor Store”"